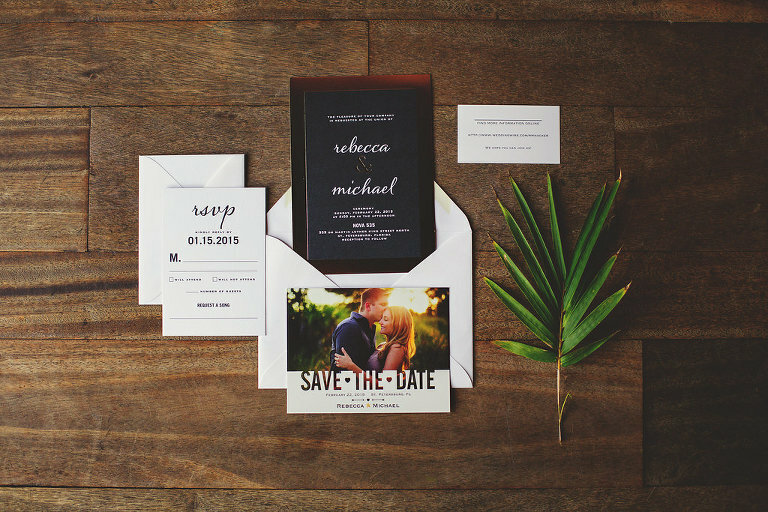 To keep their wedding day organized and convenient for their out-of-town guests, Michael and Rebecca searched for St. Pete wedding venue that could host their entire day. The groom was in charge of choosing the colors for the couple’s vintage gold, black and ivory wedding. Which vendors that really exceeded your expectations and how? It was important to find a makeup/hair vendor that had a flexible schedule for me to attend a trial session, was within our budget and had a range of artists/styles to fit our needs. Michele Renee The Studio was perfect for us! Usually, I don’t wear much make up, but Darlene was able to create a natural look, where I still felt like me, but even more glamorous. Our looks lasted all day and as we danced through the night! 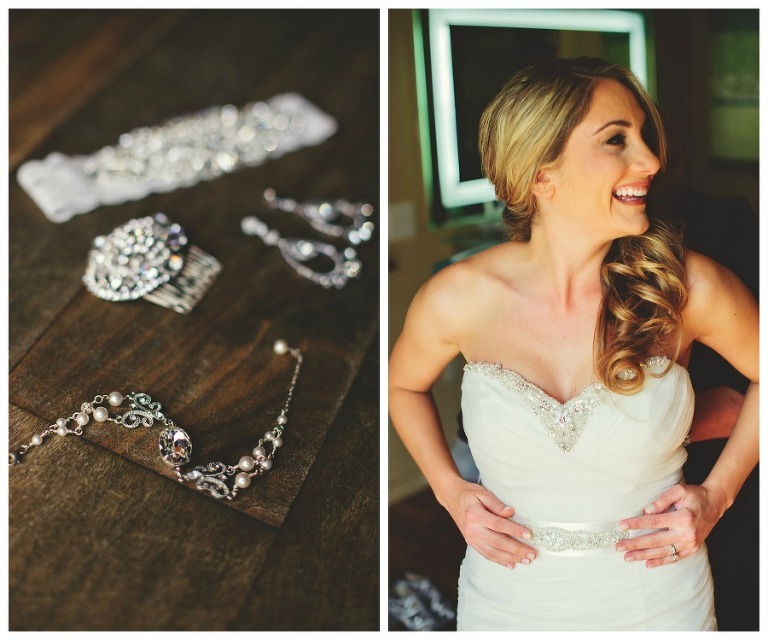 Our first look really set the tone for the day. [It was so memorable] seeing my husband’s beaming face for the first time and dressed to the nines! Being able to spend time with each other before the ceremony took the edge off. We walked down the aisle happy and comfortable instead of a ball of nerves! It was a complete surprise! We were coming up on our 2-year anniversary, but hadn’t decided on celebrating with any special plans. Little did I know, Mike was already planning to propose later in the year at the finish line of the Marine Corps Marathon, but as soon as he had the ring, he couldn’t wait to ask! It was a normal Friday afternoon, as I came home from a pretty rough day at work, both arms full of my belongings. As soon as I walked in I dropped all of it! He had secretly taken the day off work and bought every single rose at the florist! There were pink, red and white roses, bunches of candles and balloons everywhere! And there was Mike, dressed up and down on one knee. I immediately threw my hands over my mouth and started to cry as he also got emotional, completely skipped what he had prepared to say and asked me to marry him! Of course it was a very happy, “YES!,” and we spent what felt like the next 10 minutes embracing in the doorway. Elegant with a vintage touch. I love the Gatsby-esque style: metallics, sparkles and lace, while Mike liked more elegant wedding styles and rich colors, so it was a blend of the two. Gold, black and ivory. Mike chose the colors for the wedding; it was the first thing we did after we became engaged! His alma mater is the University of Central Florida and the colors worked well for what we had in mind for a decor theme. What were the deciding factors for choosing NOVA 535? It was important for us to find a venue in our budget where we could hold all the wedding day activities in one place and that allowed us to still bring in our own vendors. NOVA 535 was more than willing to accommodate our entire day from the getting ready suites, to the courtyard ceremony and indoor reception. There is nowhere like NOVA 535 in the area. It has an ambiance that just makes you want to party and enjoy yourself. While the guys bonded at the bar downstairs, us girls enjoyed having our suite and own bar in the loft to spend time together getting ready. From the exposed brick walls, wood floors, outstanding bar, and iron staircases, the venue is stunning. Try not to get caught up in the process. Give yourself plenty of time to plan the wedding of your dreams. Do your vendor research. It will save you money and time down the road. Although we both liked the planning and decision making for the wedding ourselves, a day of coordinator is a must. It allows you to soak in and enjoy your special day without worrying about the who, whats, whens and wheres. The day will fly by in a blur no matter how much you try to slow it down, so cherish the journey together leading up to it and don’t forget the reason why you’re there! 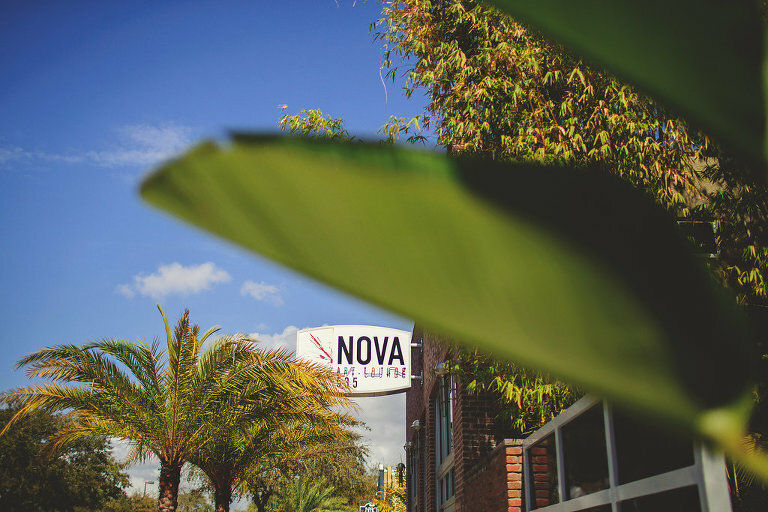 We are proud to have NOVA 535 as a Marry Me Tampa Bay member!